Arthritis of the joint at the base of the big toe is common. This will often cause stiffness, swelling and pain in the joint. 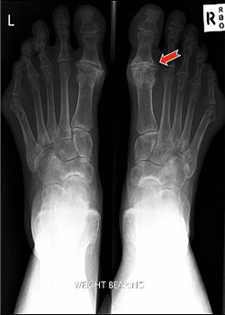 This problem may be associated with a bunion deformity or with gout of the joint. The initial management of the problem involves the use of anti-inflammatory medications and possibly the use of a carbon – fibre orthotic to reduce painful jamming of the toe. If non-operative measures fail to give adequate relief of symptoms then surgery is indicated. The surgical staff of our clinic will recommend a procedure that is selected based upon the severity of the arthritis and your particular requirements. The surgical options available include, a cleaning out of the joint or cheilectomy, arthrodesis (fusion or permanent stiffening of the joint) and artificial joint replacement. Our surgeons usually perform this surgery as a day case procedure under a local anaesthetic ankle block and intravenous sedation. 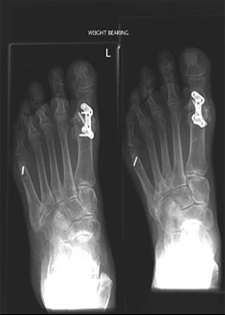 Patients are usually able to walk on the operative foot immediately following surgery in a special rigid-soled post-operative shoe. 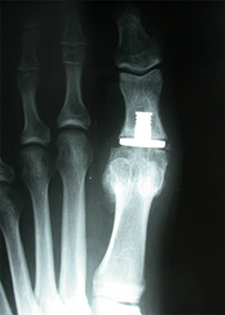 Pre-operative x-ray of a patient who presented with a painful arthritis in the joint at the base of the big toe. Note that there is a loss of the joint space and bony spurs (osteophytes) have formed around the margins of the joint (see arrow). 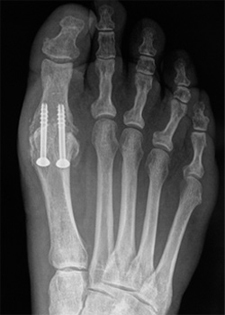 Postoperative x-ray following fusion surgery to permanently stiffen the arthritic joint at the base of the big toe. 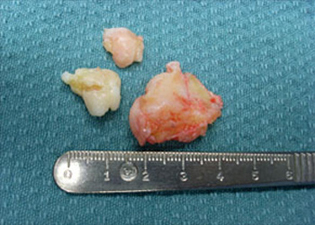 Two titanium screws have been used to hold the position while the bone ends knit together. This patient has moderate arthritis in the first metatarsophalangeal joint. 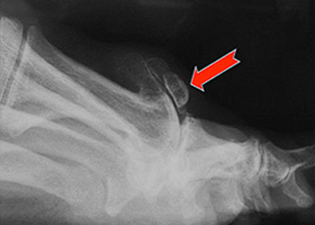 The arrow illustrates the bony spurs at the top of the joint. These cause severe discomfort for the patient as they rub in shoes. 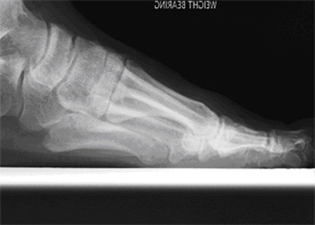 A picture of the foot of the same patient showing the bony prominence on top of the big toe. Note the irritated, red, appearance of the skin over the bony bump. X-Ray after bony spurs were surgically removed. This patient with osteoarthritis of the big toe has undergone a partial joint replacement of the metatarsophalangeal joint. 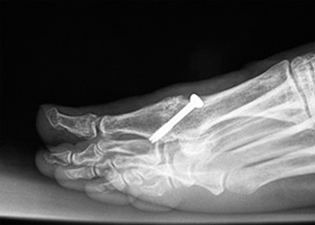 In carefullyselected cases, this type of surgery can provide pain relief and maintain some movement of the great toe.